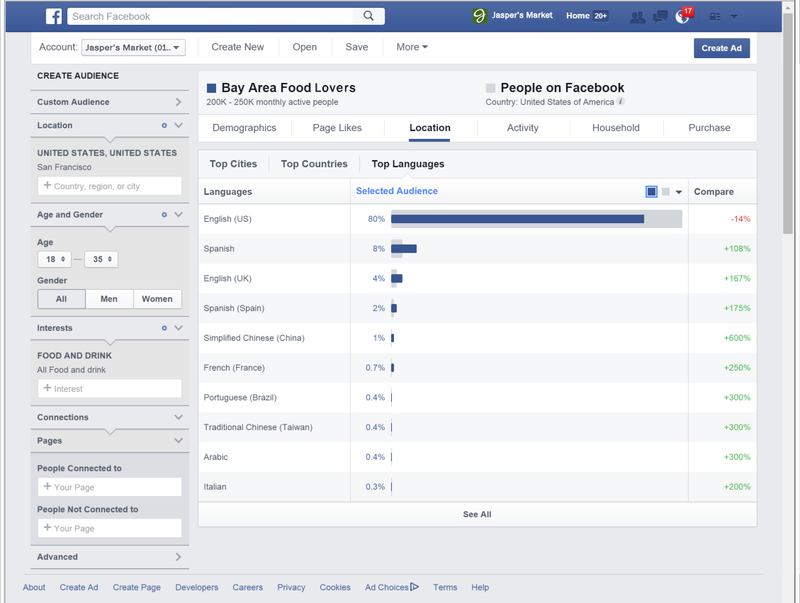 This is the second post in a comprehensive series on How to advertise your restaurant on Facebook – Audience Insights. 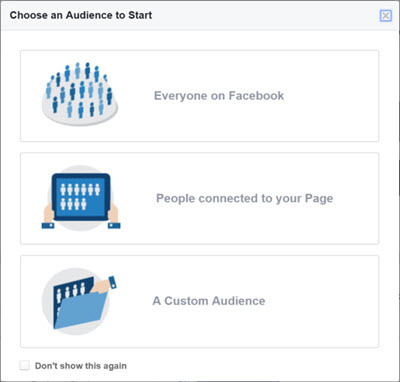 In Part 1: How to advertise on Facebook – Audience Insights – Building Your Custom Audiences we detailed how to build your custom audiences in Facebook to understand who are your customers and who are the people that are interested in eating at your restaurant but have not visited yet. 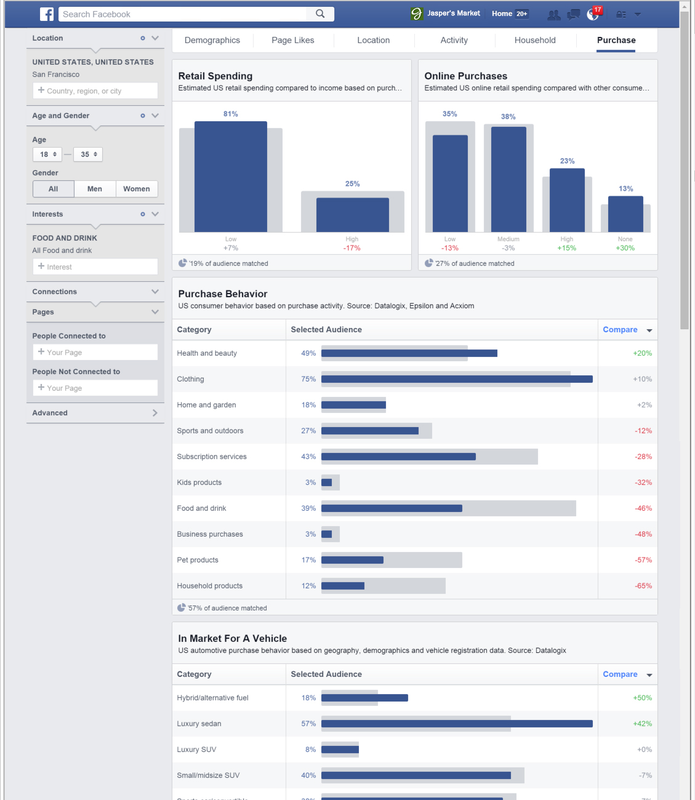 In Part 2 we will look at how to use Facebook Audience Insights to analyze your current customers and interested prospects to identify who are your ideal customers. 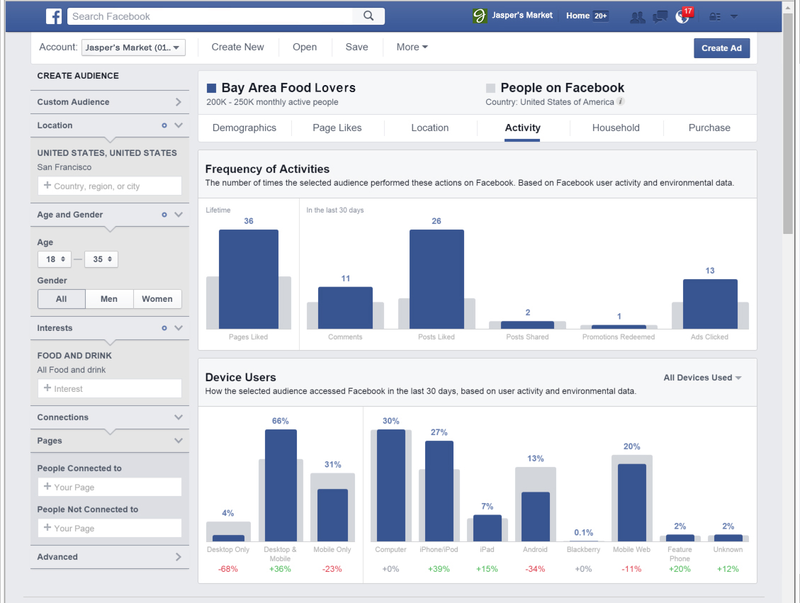 Facebook Audience Insights allows you to learn more about your custom audiences, whether you care about geography, demographics, lifestyle, purchase behavior, or all of the above. The more you know about your customers, the better you can tailor your message and creative to attract new customers. We recommend analyzing your Custom Audiences with the Audience Insights tool to understand who are your target customers and to build buyer personas. 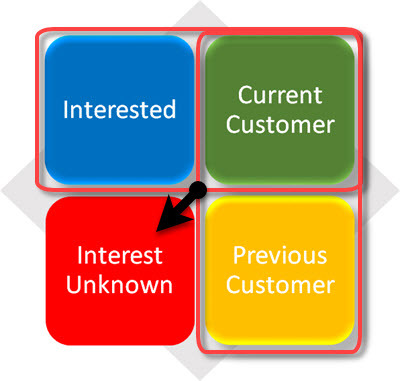 Buyer personas are research-based archetypal (modeled) representations of who buyers are, what they are trying to accomplish, what goals drive their behavior, how they think, how they buy, why they make buying decisions, and where they buy as well as when buyers decide to buy. The purpose of researching and modeling buyer personas is to get a better understanding of your buyers and their buying behaviors. The goal is making informed decisions on marketing and advertising strategies. Buyer personas can help you drive more sales and increase customer retention by creating more relevant, highly targeted messages for niches within your audience. Buyer personas allow you to think about your buyer as if you were describing a real person in terms of demographics, personality traits, like and dislikes, goals, and what they buy. Developing buyer personas allows you to create content and messaging that appeals to your ideal customer. It also enables you to target or personalize your marketing for different segments of your audience. 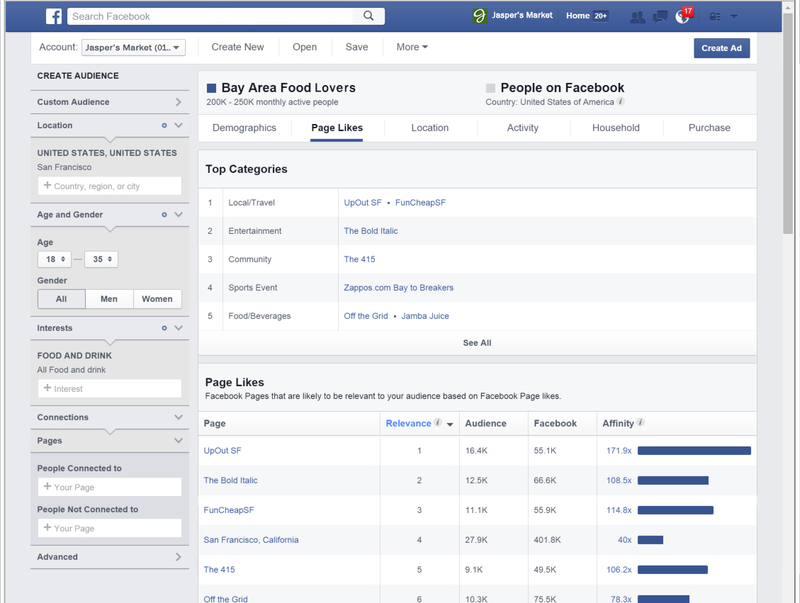 The following screen shots will show you the insights you can get by analyzing your Custom Audiences. Select your custom audience(s) from the left-hand navigation bar on the opening screen to the Audience Insights. 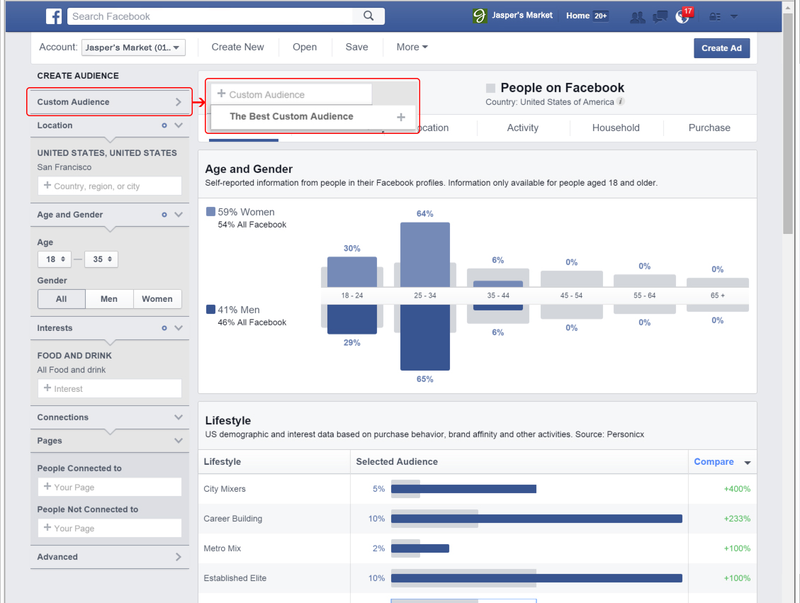 After selecting the custom audience the first screen defaults to the audience demographics. Your audience is represented in blue whereas the comparison audience (the entire Facebook population in your country) is represented in gray. Page Likes shows the top interests of your audience. Note: Page Likes interests can potentially require a large audience of thousands of users to return relevant results. Location shows the top cities, countries and languages of your selected audience in comparison to the entire Facebook population in your country. Facebook uses a number of factors to determine location, including the city people say they live in, events with public location sharing, and other factors. Activity shows the median number of actions your audience has taken over the last 30 days. This includes Page likes, comments, post likes, post shares, promotions redeemed, and ads clicked on. 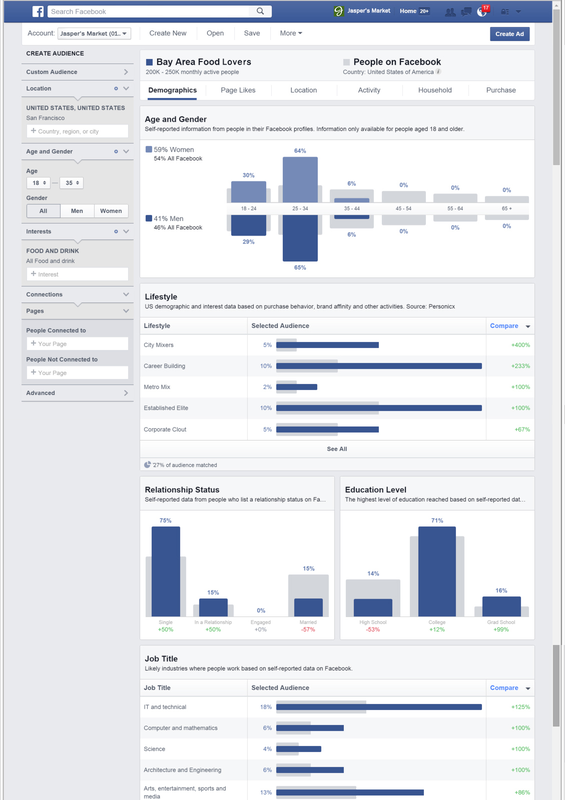 Activity also shows the device through which your audience accessed Facebook in the last 30 days. Note: Facebook does not allow targeting of people with Household income under $40K. The main reason for analyzing the audience insights of your current audience is to understand who is your audience and identify your ideal customers or buyer personas. Your restaurant may appeal to multiple personas. You should customize the advertising content for each persona that you’ve created, including the image, description, headline, and offer. 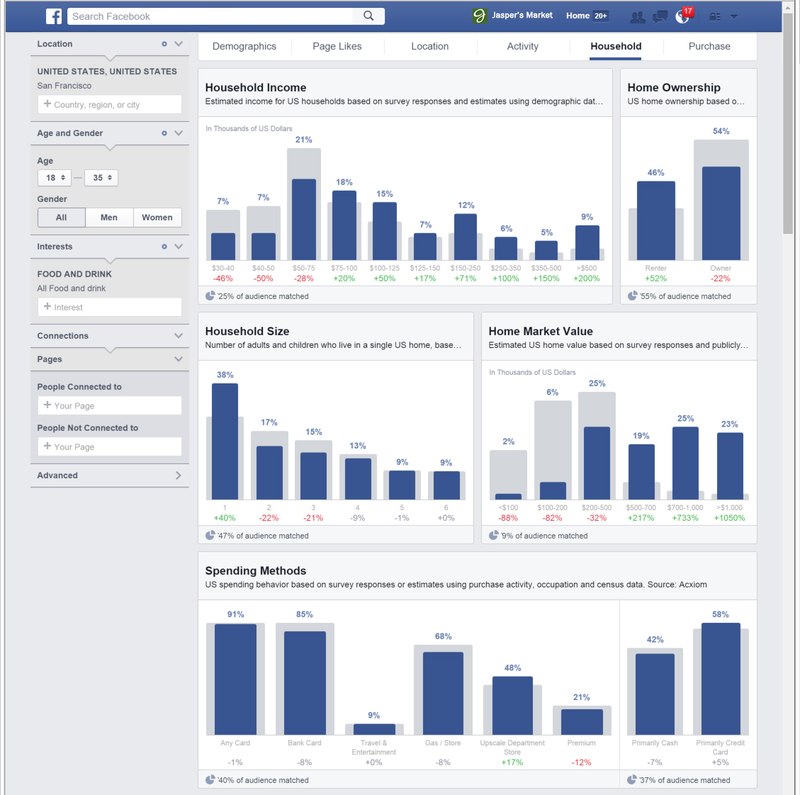 When you create personas from Facebook’s Audience Insights, you create personas that are well researched and extremely relevant to your current customers. This can only deliver targeted ad campaigns that will get you better results over time. Below is an example of a restaurant buyer persona. Sally is a working mom married with two children. She is college educated and prefers family meals deals that are carry-out. Sally makes above median household income and owns her own home. Sally likes Amazon.com and football. Sally spends most of her disposable income on Clothing, Kids products and local restaurants. Sally’s buyer persona is an example of what you could develop by using Audience Insights and analyzing an Online Ordering custom list. Her specific characteristics were pulled from the audience insights data. To make Sally real tell her story as if you were describing a real person. Your description however should be broad enough that Sally would be representative of the larger group or your ideal target customer. When your team meets to discuss your marketing and advertising campaigns and strategy keep the conversation focused by talking about “Sally” or which buyer personas you intend on targeting. In Part 3: How to advertise on Facebook – Lookalike Audiences – Targeting Similar Customers we will look at how to use lookalike audiences to target new customers with Facebook Ads. Great overview of how to properly analyze the data presented by custom audiences at a basic level Dave. You should include a link back to the previous article in the series at the end as well, for a refresher on those following.